Did you know that the Goji Berry is called the world’s most powerful anti-aging food? Li Qing Yuen is documented as being the oldest person to have ever lived in recorded history. Born in 1678 and living to 1930, he was documented by the Government of China as having lived to 252 years of age. Twice he received Longevity Awards from the Government. It is said he ate Goji berries on a regular daily basis. Goji Berries are also used by the people of Tibet to increase longevity and as a general health strengthening tonic. Many of the people in some areas of Tibet and elsewhere who regularly eat the berries are known to commonly live to be over 100 years old with no health problems! Now that deserves some attention. Contains a complete spectrum of antioxidant carotenoids, including beta-carotene (a better source than even carrots) and zeaxanthin (protects the eyes). The goji berry is the richest source of carotenoids of all known foods. 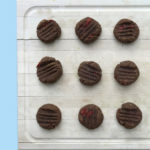 This is a simple cookie recipe you can easily make under 20 min. 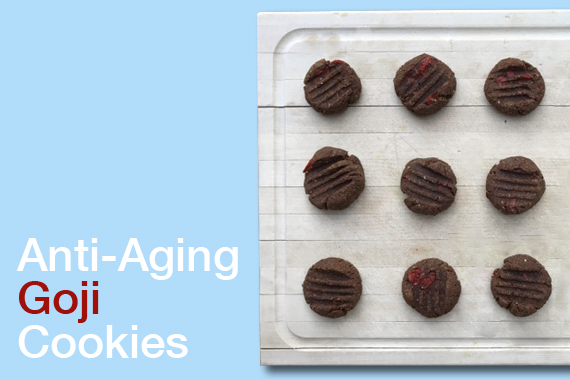 I personally enjoy them raw, to preserve all the nutrients, however if you prefer a more traditional cookie texture, then baking them in the oven at 350F for 10-12 min will do the job. In a food processor fitted with the S blade, blend the oats, almonds, and salt into a fine meal. Drain the goji berries, add them in the food processor together with dates, pulse until combined. Add the almond butter, almondmilk,coconut and cacao powder, and process just until the dough forms into a ball. Using a teaspoon scoop and drop the dough onto a baking sheet lined with parchment paper. Roll into round balls, if desired, then smoosh with a fork. Freeze for 30 minutes then transfer to an air tight container. Cookies will keep in the freezer for several months, but best when eaten within couple of days. Bake in a preheated oven at 350F for 10-12 min. Let cook, transfer into a container and store in a cool dry place or fridge for up to 4 days.